The life of a schizophrenic is unquestionably depressing. Unable to hold down a job, earn a living, or sustain basic human relationships, many people who have schizophrenia are understandably depressed. For people who have to endure schizophrenia, depression can be both situational and brain-based. Treating depression in schizophrenics, however, is problematic. That is because the same receptor on neurons in the brain, known as serotonin receptor 2A, also generates hallucinations. Giving schizophrenics antidepressants can cause them to become even more out of touch with the shared definition of reality, and nutritional supplements such as 5-HTP and tryptophan also carry the risk of making a bad situation worse. In 2010, scientists at the Scripps Research Institute discovered biological pathways that may make it possible to stimulate the serotonin receptor 2A without creating the proteins that cause hallucinations. Drugs based on this discovery, are least 5 to 10 years away. In the meantime, what can be done about depression in schizophrenics to support mainstream medical treatment? Population studies have found lower rates of schizophrenia among people who consume more fish, more omega-3 essential fatty acids, more omega-6 essential fatty acids, and more vitamin D. Omega-6 essential fatty acids are often described as "bad," but they are also necessary for human health; the problem usually is that people get far more omega-6 than omega-3. These nutrients may not cure schizophrenia, but they may help reduce the severity of symptoms. The farther you live from the equator, the more likely you are to have schizophrenia. This is in part due to genetics (the greatest concentration of genes for schizophrenia occurring in the northern British Isles), but it may also be due to lack of sunlight. When possible, get 20 minutes of sun each day, without using sunscreen. But don't get more. Take a complete B vitamin supplement every day. 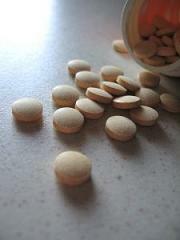 The key nutrient is niacin, but you should not take niacin without also taking other B vitamins. Some people with schizophrenia have gone into remission after treatment with high-dose niacin, but this should only be done in consultation with a physician who has experience with the treatment. Usually a dose of niacin large enough to cause remission from schizophrenia will also cause redness in the face and itching. Niacinamide will not cause reddening of the face, but it can dry out the mouth and cause nausea. And another way to help relieve the burden of schizophrenia? Let someone else change the cat's litter box. Cats that are infected with the microorganism Toxoplasma gondii can pass its cysts to their human owners. The cat gets over the infection quickly and is immune for the rest of its life, but humans who come in contact with the cysts from cat feces can develop schizophrenic symptoms. (This explains the real meaning of the term "crazy cat lady" or "crazy cat man.") Treating the infection sometimes relieves, although seldom cures, the schizophrenia. Serotonin Syndrome Symptoms - Early Warning Signals of a Potentially Fatal Complication of Increasing the Dosage of SSRIs. "...I also suffer from mild-to-moderate depression, so several months ago as an experiment I ordered a few bottles of the Neuro-Natural Serenity formula, but never took it consistently. However, I started taking it faithfully last week at full dose and already my spirits are lifting and I have a greater clarity of mind."